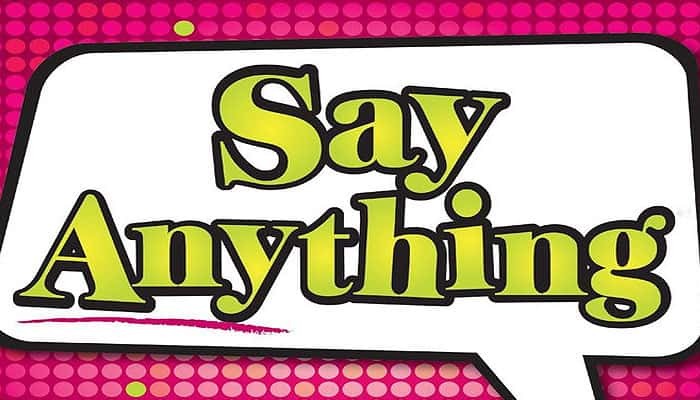 Say Anything is a light-hearted game about what you and your friends think. It gives you the chance to settle questions that have been hotly debated for centuries. For instance, "Who is the most overrated band of all time?" or "Which celebrity would be the most fun to hang out with for a day?" So dig deep into your heart or just come up with something witty - this is your chance to Say Anything! 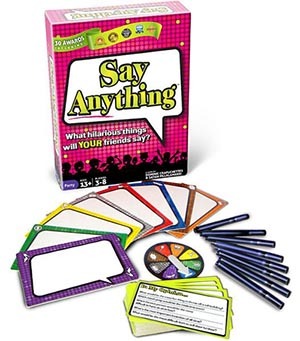 Each player gets a Dry Erase Pen, an Answer Board, and 2 Player Tokens of the same color as their Answer Board. You'll also need some napkins to wipe off your answers in between questions. Choose a Score Keeper. This player will write down the scores after each round. The Score Keeper gets the Score Board. The shortest player goes first This player gets the state-of-the-art SELECT-O-MATIC 5000. If you have the SELECT-O-MAT1C 5000, then it is your turn. Draw a Question Card. 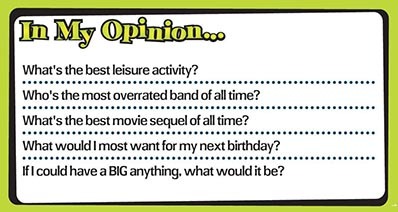 Choose any question from the card and read it out loud. Everyone else writes an answer on their Answer Board and places it face-up on the table. Once all of the Answer Boards are face-up on the table, you will use the SELECT-O-MAT1C 5000 to secretly choose your favorite answer. When you are done, place the SELECT-0-MAT1C 5000 face-down on the table. Split their Player Tokens between 2 different answers. Players do not have to choose their own answer. Once everyone else has placed their 2 Player Tokens, turn the SELECT-O-MAT1C 5000 face-up. 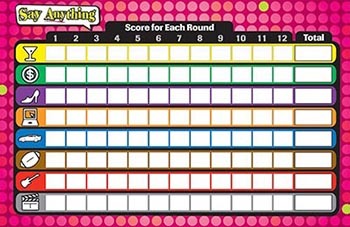 You get 1 point for each Player Token that was placed on the answer you chose, up to a maximum of 3 points. The other players get 1 point for each Player Token they placed on the chosen answer. The player who wrote the chosen answer gets 1 bonus point. Note: The maximum that any player can score in a round is 3 points. Make sure players don't take back their Player Tokens until the round has been scored. Everyone takes back their 2 Player Tokens and their Answer Board. Erase your answer with a napkin, not with your finger (that leaves an oily residue). Pass the Question Cards and the SELECT-O-MAT1C 5000 to the left Play the next round. 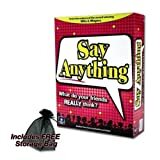 3 - 4 players: The game is over once everyone has asked 3 questions. 5 - 6 players: The game is over once everyone has asked 2 questions. 7 - 8 players: The game is over once everyone has asked 1 question. At the end of the game, the Score Keeper totals each player's score. The player with the most points is the winner. But remember - Say Anything isn't really about winning, it's more about having fun! In the case of a tie, the last place player chooses a song that everyone knows. Each of the players who tied for first place must sing a line from the song and do a short dance. The last place player picks their favorite performance and that player is the winner.